I'm currently reading Supergods and got to the page where Grant Morrison informs the reader of just how successful his Arkham Asylum was and remains. It inspired me to go through my collection to see if I still had it, only to confirm my suspicion that it had been eBayed in the great comic book purge. Going through the comic box meant passing by Witchblade, which suddenly reminded me of that issue 29 where, at the request of Randy Green, I designed some outfits for Pez to wear, which he subsequently drew. This, in turn, inspired me to enter the storage room - a place of great mystery and desire for both the cats and the kids - to hunt down my scrapbooks to find the original design sketches I had made for Randy. They are filled with everything that I thought was cool and important during highschool and university. That means lots and lots of comic book pages, characters and posters, with many thanks to Wizard Magazine (R.I.P.). 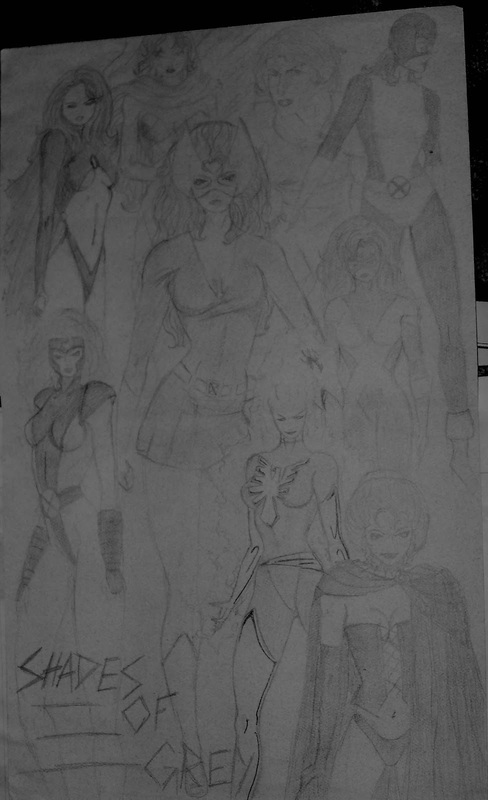 Also, my own sketches and drawings, including one of Jean Grey, who never did get to be all she could be, but, after recently reading Phoenix Endsong, I'm glad to know she's finally found some peace. I've got drawings from friends and sketches of my own characters and notes from their various stories. The scrapbooks go through my various phases, with one boasting pages and pages of movie tickets (yes, I did see The Rock three times in the theatre; remember that time we dressed up to see Tank Girl? ), while another focuses on my night club days, with lots of cool and creative advertisements and images in between. I have a shrine to Angelina Jolie (from which I later designed a website) in one book, and a shrine to Brad Pitt in another. I knew they were OTP long before they did! "There may be no other culture in the world where children are simultaneously so valued and so devalued, where the having of them is deemed so important and the raising of them treated so casually." My highschool self even had the foresight to include some parenting advice. I've recently purchased notebooks for the girls so that they can start their own scrapbooks. Hopefully, some time in their future, they'll find themselves looking back fondly at their own amusements, interests and memories, too. Ironically, I never did find the Witchblade designs I actually went looking for.